iven and kashmira – Page 3 – jesus. bangkok. neighbors. us. 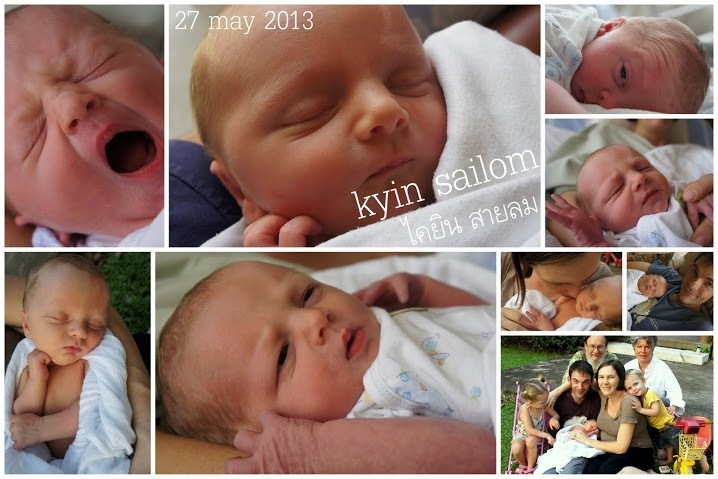 We welcomed our newest child, baby boy Kyin Sailom Hauptman into the world on May 27, 2013. You can see our full baby announcement here: Kyin Announcement. Our kids’ patience for street outreach and conversations with neighbors, for the most part, ran out a long time ago. People on our streets, strangers or not, rarely hesitate to pinch their cheeks, take their pictures, or try to pick them up despite their loud hollers of protest. It is one of the harder aspects of parenting in our context. Our hearts are both to love our neighbors and love our kids, and sometimes it seems like both can’t be done at the same time. There is, however, one group of neighbors that are an exception to the rule of “hard for our kids to interact with”. It is a bit unexpected, and also beautiful, in the sort of way Jesus’ upside-down Kingdom works. For more than a year now our children have gravitated towards our street neighbors who are sickest, weakest, and most in need of physical care. Oddly, those neighbors are “safest”, from the perspective of our kids. Izayla once made a list for me of the neighbors she likes the most. All of them were in advanced stages of liver failure or had HIV/TB. “Why do you like them so much?” I asked her. Her answer was simple enough, “Because none of them try to pick me up.” True – most of them don’t get up much at all, let alone attempt to muster the energy to interact directly with our littles ones, except to smile weakly and say hello. Physically, these friends are probably the greatest “risk” to our children, especially thinking of those with active TB. we try to be careful and wise to limit physical contact with the kids, but it is truly beautiful to see Izayla and Elian both come out of their shells and freely engage with our friends laying on the sidewalk. They feel safe, and don’t have to worry that their boundaries will be crossed by these neighbors. Because of that, our hearts are even softer towards these neighbors than they would otherwise be. We see the softness that Jesus would have interacting with these friends through the hearts and posture of our kids. Yet another place we are seeing them lead us more and more into the Father’s heart. Who’s Reaching Out To Whom? Recently, Iven received a phone call from a Thai University professor who heard about the “project” where we share food with homeless people from one of her students who was attending ECB, and wanted to begin sending some other students to come participate, practice their English, and do community service. A few weeks later nearly a dozen Thai college students, primarily Buddhist, showed up for the outreach, were paired up with volunteers from ECB, and headed out to connect with our neighbors. Kashmira’s group consisted of our good friend from life-group, Steve, and an artistic young Thai woman who’d spent some time living in Europe. Stopping to talk with a huddle of older homeless men a block down from our house, the Thai college student readily agreed to translate for our Kenyan friend, Steve. Unexpectedly she found herself back-translating the Gospel message from Thai into English as one older Uncle we’ve known for quite some time shared with her about how Jesus is true, forgives our sins, loves us and is different from other gods. It was a sweet and special backwards-outreach sort of moment, the kind only Jesus can orchestrate. Before 2014 began, Kashmira felt like the Lord was nudging her that the season has come to begin doing outreach on the Loop again, where young men are involved in street prostitution late at night. Now, with our beloved Dutch teammates Lilian and Matthijs done with language school, and available to partner full-time, we are able to pick that up again. Our team is starting slow (two nights a month), and involved in prayer as much as in outreach, but as has always been the case on those streets, we see God’s hand leading us each and every night we go out. It has been special to reconnect with a handful of guys who knew us since before we became parents, and to live out a newfound boldness and hunger to see God’s Word shared on those streets. Another unexpected aspect of loop outreach is several of us feeling a softness and desire to connect not only with the guys who are selling services, but also the “mafia” (motorcycle gangs) that collect a “tax” from the guys working in their turf. It’s a complex and unique scene, and God’s presence is all over it. Iven’s first night out we were praying before-hand, asking God what He wanted to do that night and someone felt like they heard the name “Golf”. The first guy Iven’s group approached was super-open to hearing about a God that is like a Father, and as the conversation progressed we found his name was, you guessed it, Golf. Recently, we were able to sit with three young men, who were clearly desperate for a fix and working hard to flag down customers, probably for close to half an hour. It was a simple and sweet time, where we just sat with them, and quietly played blessings and protection in the name of Jesus over their young lives. A little motorcycle snack cart pulled up. Kashmira bought a pumpkin custard square, and agreed to buy some fried tiny frogs for one of the guys. Grubs (fried little white insects – a bit like cheetos) were also purchased and passed around. Loop outreach is the only place Kashmira feels compelled to eat any sort of bugs that get offered – perhaps it is just a mark of her calling. Join us in praying for boldness, clarity and God’s abiding presence to be our sustenance on The Loop. Back in January of last year we sat through a few sermons from Shane Clayborne, one of our heroes in this Kingdom journey, as part of a conference on International Urban Ministry. Great teaching, great conference. A year later we are still clearly chewing on it. Shane’s primary text was the Parable of the Good Samaritan (Luke 10:25-37). Recently, I listened to a Heidi Baker sermon on the same text online. Our modern day heroes of the faith like these use phrases like “the dying man” on “Jericho Road” (a place of danger and risk) and call us to stop and see, and then respond to the needs of the man or woman helpless in the gutter, along our path. A few weeks ago, Iven was heading outside to do some computer work at a coffee shop and there was a man looking sick and passed out right next to our back alley door. Given that our job is to “not pass by”, he got some water and tried to rouse him enough to drink a little bit and make sure he was not in need of medical attention. Iven was sitting there next to the groggy and pained man, reeking of alcohol, while the busy street food shop with all its customers and workers looked on. A woman we know well from a neighboring shop came over to Iven and lowered her voice to say that while the man was passed out she saw a woman come and take his stuff. She didn’t do anything about it, mind you, she just watched him get robbed while he laid unconscious on the sidewalk. No doubt several other people did the same. We live on Jericho Road. Heidi Baker, Shane Claiborne, and our family may have real-life gutters and real dying people on the streets where we live and work. But all of us as Believers are called to walk, see and stop to listen, heal and bind up the broken-hearted, those wounded in body and in spirit. What places of risk does God want to lead you into? As you walk on your own Jericho Road, what does God want to open your eyes to see? Who does He want to lead you to stop for, to touch with hands of healing and mercy? Ask Him, and He will surely invite you to be His hands and feet on your own corner and in your own community. We returned from America two weeks in to Izayla’s new (preschool) term, which meant she was two weeks behind at learning the dance her class was preparing to perform at the school’s big annual fundraiser show. Piling this set-back on top of being the only kid (in the school of 20+ classes) for whom Thai is a second language, and everyone’s desire to see the cute little white kid perform – well, needless to say, she was pretty stressed out. Of the 28 acts during the show about half of the songs were in Thai and half in English. 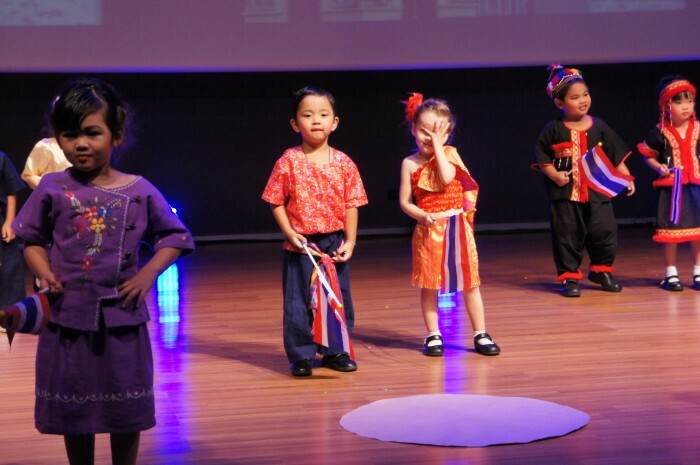 Izayla’s class performed to a song called “Pratthet Thai” (Thailand) and each of her classmates wore one of four sets of traditional Thai-style clothes, from each of the four regions of Thailand. Izayla’s outfit was the quintessential Thai-style bodice and woven Thai silk over-the-shoulder cover. I was thinking how fun and fortuitous it was that our little lady got to be in a very Thai dance performance (as opposed to say, “Santa Claus is Coming to Town”) and then it occurred to me that, of course, everyone knew she was the only Farlang (foreign) kid and it is likely that song was hand-picked for her class because she was in it. Oh yeah. On the big dress rehearsal day she was a mess. She stayed on stage, but refused to participate even a little a bit, and then exploded into tears as soon as she left the stage. The poor kid, having had her photograph taken thousands of times by strangers already in her short 3 1/2 years, just couldn’t handle the crowd of parents snapping photos all around her. We can’t blame her really, and can only identify with her experience from the outside. It’s hard to be the only white little girl in our neighborhood, in her school, most places she goes…in a context where strangers tend to feel it is the duty of children to look cute, have their cheeks pinched, be picked up, and have their photos taken. Oh well, we are grateful that we care so much more about her little heart than about having cute pictures of her, or looking good in the eyes of the school administrator. We trust that her teachers care for her heart as well, and since the show she has settled into a happy school routine again and seems to be enjoying it and increasingly more confident to spout out Thai phrases – especially as she engages with other kids at the park – asking if she can play with their ball, try on their shoes, or share a treat! I know she loves not having to go through Mom and Dad anymore for those requests – she is much more likely to get whatever she is asking for! “Mama, that lady has a hurt foot. We need to pray for her,” my three-year-old declared matter-of-factly one evening as she pointed towards a woman sitting on the street with a bandaged foot. We were walking home from eating a street-side dinner of Pad Seaw and my husband Iven had paused to “say hello” to a deaf woman we knew, who was also homeless, just a few feet away. This was how we met Ap – Izayla, our three-year-old daughter, essentially introduced us, and our family began visiting her on her corner regularly, often on our way to or from dinner. Our teammate, Pat, (who met Ap at about the same time during one of the regularly scheduled ECB feeding the homeless ministry nights) got to know Ap much better than us, and both Ap and Sunshine (the deaf woman who shared the corner) became the recipients of much love and energy from Pat. Elian, our one and a half year old son, did his part too – for whatever reason he clung to the notion of visiting Ap every single time we left our house. He would point to her corner a few blocks away and call out, “Ap, Ap!” – Pat, who is the darling of our three year old was a teeny bit annoyed that Elian learned to say Ap before he could say Pat. Our job is a strange one – as the leaders of Rak Teh (a mission partner of ECB) we live and work in the Sanam Luang area – in the middle of a neighborhood that wears it’s pain and hardships more visibly than most. Many of our neighbors are homeless, and/or involved in prostitution and we see our job as simply pursuing the two greatest commandments in the place God has planted us, namely to love Him with all of our hearts (this is often expressed through active prayer) and to Love our neighbor as ourselves (usually through building intentional relationships and looking for opportunities to extend tangible care to those around us). Pat helped Ap to get a government ID card, and along with others from our team also helped her get to the doctor regularly, as she had some complex and serious health problems, including the very bad abscess on her foot which Izayla had first noticed. Pat shared some of God’s story with Ap, and she was a bit interested – it was one of the many things they talked about together. Ap’s health seemed to be getting much better, as she began regularly taking TB medication that was having some success with the rare TB meningitis strain that was in her brain and causing horrible headaches. Ap was the first neighbor on our streets that Izayla asked to pray for. Hers was the first name Elian learned, and proceeded to repeat all the time. Pat was working with her to move forward in many practical ways. I felt like God’s hand must be in this – it seemed like there was a promise over her life. About three months ago (This past Songran) Ap disappeared from her corner for a few weeks (people are always coming and going from our streets), reappeared briefly and then disappeared again. Pat was out of town at the time and when she came back and began asking around, discovered that Ap had collapsed and been taken to a hospital over a week earlier. When she finally found her Ap had been in a coma for almost two weeks, had received no visitors, and the doctors expected her to not recover. Less than a week later she died. This is not a naturally hopeful story. Usually faith stories shared here at ECB, and rightly so, are stories of encouragement and testify clearly to God’s goodness and sovereignty. I don’t seem to be doing that right now. The truth is, there has been a lot of death on our streets in this season. This is just one of many stories we could tell of walking alongside of neighbors as their life comes to a close, for those of you who know some of our neighbors through Feeding the Homeless and haven’t heard, Sunshine passed away just a few weeks after Ap. This may seem like a depressing story, but I don’t’ think we need to hear it that way. It is a true story – death is everywhere – on our streets more than on most, perhaps, but there is also life and God’s activity. When Ap died, I felt confused, because I was pretty sure I had heard God whisper to me promises of redemption and healing in her life, in large part through my children. Elian continued to tell me “Ap Sick” for weeks after her death, and it has been hard to figure out how to explain to them why we don’t pray for her any more, or at least not in the same way. But I do believe that God is in fact faithful, good and sovereign, even when we can’t see it. Could it be that He led my children to become champions of and friends of Ap because He knew her life was almost over, and He wanted to do a work to love her and show Himself to her through our team, even if we never got to see her receive him? A few months ago, another friend from the streets, who our family was very close with, passed away. The morning that Iven received the phone call from the hospital telling him that Wa had died, he felt prompted in his spirit to look up Psalm 103:4. I will read out verses 1-4 for you. This is our God. He is in the business of redemption and renewal – sometimes that is visible and we can tell flashy stories and celebrate together. Sometimes we just need to rest in quiet trust that it is true. Our job is to declare that truth on our streets and with our neighbors. ECB has a regular monthly ministry time down in the Sanam Luang Area called feeding the homeless in partnership with the YWAM ministry, RAK TEH – which means authentic love. Usually it is on the 3rd Saturday of the month at 4:00pm. All are welcome! For more information please check out the ECB Website. Its strange seeing ourselves, a bit of our life and even our home on TV. Stranger still when walking down the street in a far corner of the city the next day some motorcycle taxi drivers call out, “Khun Mali, rue plao?” (Kashmira’s Thai name: “Mali, is that you?”) Later that day, while visiting the hospital for Elian’s one year check-up a nurse approached Kashmira and said with a smirk, “I saw you on T.V. yesterday, didn’t I?” This recognition resulted in even more than the usual amount of attention and interest in our two kids. By the time we went in to the doctor’s room the nurses had the show pulled up on their computer console and were watching it at the nurse’s station. When Iven was paying the doctor bill the pharmacist came out from the back and exclaimed, “I recognize your voice – I saw you on T.V. Yesterday.” The old woman that sells fruit in our alley approached Iven later that week and said, “I never knew you loved Thailand so much…thank you for loving my country.” A week or so later Iven was taking a neighbor to (a different) hospital and without any prompting they helped jump this neighbor to the front of the line, saving them close to three-hours in the waiting room! Really it is quite an honor to be chosen to be filmed. The show about our family aired on TV on August 26, and since then we’ve received immensely positive feedback from both neighbors and random strangers alike! Needless to say, it has been very surprising how many people from different walks of life have watched the show. Our prayer is that in some small way Jesus might show through our lives (even through the producers edited out all mention of our faith) and also that some of what we suggested about how to relate to people on the streets might sink in and draw more and more “normal” Thais into appropriate, helping relationships with those in real need. If you’d like to watch the show, it has been posted on youtube in four different segments. Please follow the youtube links below, complete with a brief summary of each section to help those of you who don’t yet speak Thai follow along. 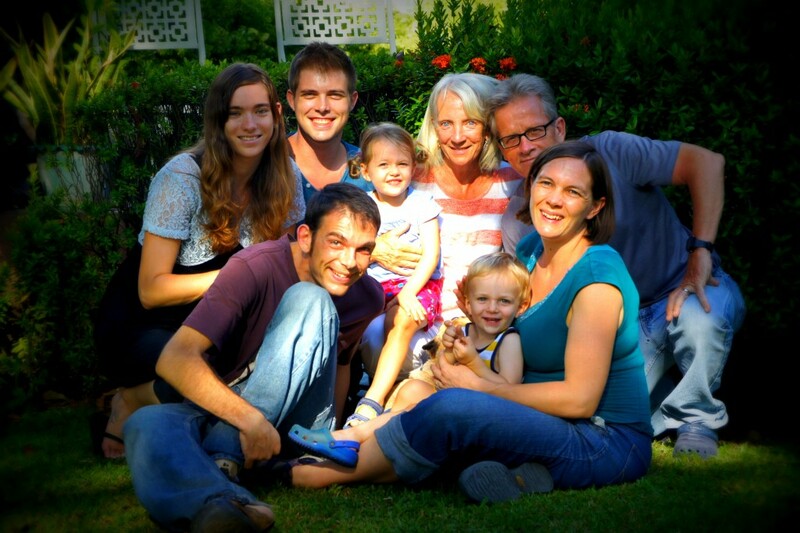 Meet the Hauptmans – Part 1 We introduce ourselves and our Thai names, sharing about how we live in a wonderful and interesting part of the city. We then take a tour of our local market that Kashmira visits weekly and whose vendors all know our kids. We discuss how wonderful Thai fruit is, especially mangoes – which our family eats daily. We invite the host into our home and explain how Kashmira had a love (and call) to Thailand first – then Iven fell in love with Kashmira, who told him that if he wanted to marry her he would need to move to Thailand too! So we came here together. When we first came it was hard because we spoke no Thai and could read Thai – felt like a child. We discuss learning Thai vs English. Introducing some of our neighbors – Part 2 Iven talks with the host about our work with the homeless in our neighborhood while Kashmira and the kids “rest” in the heat of the day. Explains how usually the kids are involved in most work and relationships. Helping people to have better lives – people on the streets who have run grom hard situations or met with hard circumstances and broken relationships, recognizing that no one ever had the dream of being homeless when they are kids. Iven explains that we began this sort of work while still living in America. Everone loves our kids and they make it easy to get to know people, and we have never felt unsafe on our streeets. The most important thing for people is hope, without hope there is no reason to live, no matter if someone is rich or poor. Introducing the host to some of our neighbors, including one man (of many) who collects used plastic bottles to resell for a small story. P’ Noey tells the story of Awt, a neighbor who was very ill and who we helped to reveive needed medical care and journeyed with until his passing several months ago. Iven introduces P’ Wa (who many of you know and have prayed for, who we’ve known for 3 years and have walked with through much). Wa lost his family and former life the 2004 tsunami. Wa thanks Iven and family for helping him to have more hope and life. Feeding the Homeless with Issarachon & Queen Mother Museum – Part 3 We our friends at Issarachon, a Thai foundation that has been serving our homeless neighbors for many years now. They are having a special feeding time to celebrate the first birthday of a relative of their board member. Along with Ajarn Natii from Issarachon we agree together that taking time to form real relationships, which communicates value, is the most important way to help and serve people in hard places, like the homeless. We discuss how difficult it is for people who don’t have government ID cards. We meet Nuat, a neighbor we have known for about two years. The food is all gone now – host says it is good for him to see how people serve like this. Iven explains how important it is to see the value inside of people, no matter how dirty they might be on the outside, or what they look like. Queen Mother’s Museum We bring host to the museum park commemorating the original house of the queen mother and her life of service and sacrifice. Izayla meanwhile loves her sticky rice (khao nieow). We look at memorials and discuss what a wonderful example the queen mother (the mother of the King) was as a mother and leader. Feeding Fish, Boat Ride, and Mother’s Day Activities – Part 4 We go to feed the fish at the river and explain how Kashmira spent much of her childhood in the ocean on a fishing boat her parents built in the driveway. This is one of the reasons we gave Izayla the middle name “Talae”, which is Thai for sea. We discuss how important the rivers and waterways are for Thai life. Then we take a boat together through a big rain storn and talk about the different festivals in Thailand that involve water, including the most well known such as Songran – national 3 day water fight that takes place in the heart of the hot season. On the way to the mother’s day festivities at Sanam Luang we meet a group of homeless people and after talking with them a while go and get them some food, but explain to the host that we almost never give people on the streets money since so many struggle with addictions and giving money will almost always go to the addiction of choice before necessary food or water. 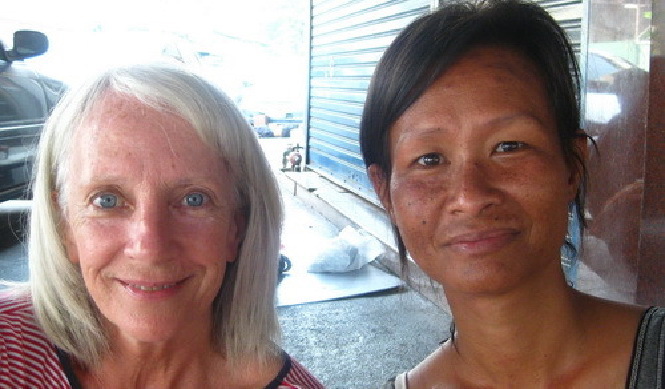 At Sanam Luang’s Mother’s day activities we express our gratitude at living in Thailand and sharing our lives with Thai people, to see even poor people caring for one another. The host asks how long we’re planning to stay here and we finish by telling the host that right now we have no plans to leave Thailand and Izayla and Iven give Kashmira a mother’s day card and Izayla says, “Suk san Wan Mae” or “Happy Mother’s Day” in Thai. Our teammates, Lillian and Matthijs, presented Izayla with a giant-sized coloring book a few days ago. It is about 2/3 as tall as she is, and the cover declares, in Thai, that it is the story of David and Goliath. Iven read it out loud (in Thai) to all of us and we established that it is indeed the story of David and Goliath…kind of…not really (you can find the real story in 1 Samuel 17) This Thai coloring book version hits most of the main story points, but quietly changes a few details. Places like where Scripture says that David tells King Saul that the God of Israel would rescue him from the hand of the giant Goliath just as He had rescued him from the hand of the lion and the bear it instead says, “This giant can’t be fought with strength but instead with cunning and new methods”. Scripture tells us that young David declared to Goliath that the God of Israel would deliver Goliath into his hands for defaming the name of the Lord; the Thai coloring book says “you will stop laughing when you see my skills!” Scripture tells us the Lord chose and appointed David to be king because he was a “man after His own heart” but the Thai coloring book says that later in life when King Saul died, the people of Israel chose David to be their king. It seems a silly thing, and as we read it aloud we all laughed at the re-interpretations in the story, but it has been bugging me all week. This coloring book never mentions God once, but presents itself as a story that would be recognized as a Bible story by anyone who cared to learn stories from the Bible. I am guilty of doing this myself at times, maybe not so dramatically extracting God from a story of which He is the center, but of minimizing His involvement, and forgetting to stop and thank Him for His guidance and gifts. I am most keenly aware of this danger as I talk with my kids. Some older friends of ours recently shared about how they made it a point to help their (now grown up) kids recognize along with them how truly central God is to virtually every story and circumstance around them. That does not mean that God is necessarily in control of and initiating everything that happens, but He is certainly WITH US in everything and He is constantly working good in all, even in the poor choices and pain. I am grateful for that. So grateful. Lord, help me to never extract You from the center of my story, the stories of my neighbors and our families’ story from which You are always so undeniably involved. At 4:00am on May 2, 2556 Jiraporn Kamjan died of completions related to Alcohol-Induced Liver Disease at Rongpayaban Klang (Bangkok General Hospital). He was 40 years old, homeless and alone in the eyes of this world. We met “Luung Wa” a little over 4 years earlier. He was serving as a security guard for the red-shirt protests in Sanam Luang, and Steve Goode (YWAM International Mercy Ministries Director) introduced us to him a few days following a YWAM Outreach event in our neighborhood. Our introduction involved sharing a homemade birthday cake with Wa on Valentine’s day, his unofficial birthday (his ID card says he was born on 17 Feb, but Wa told us it just took a few days for his mom to report the birth!) When Steve and Wa met, Wa opened up about the tragic loss of his wife, daughter, business and all of the fingers on his right hand during the Tsunami of 2004. Steve just couldn’t let that go and upon learning that Wa’s birthday was coming up, something just had to be done! A cake was baked, friends were recruited and a Valentine’s Day street-side surprise party ensued! Wa’s favorite topic of conversation was always food – his cravings would shift from day to day, but often they would hearken back to some obscure dish he’d enjoyed in a childhood spent travelling around with his family. At one point he was writing a recipe book of Southern Thai cuisine. Khao Mok Gai. Bami. Gaeng Som. Kuaytieaw Pbet. He loved museums, history and ancient things. I remember picking Wa up from a medical visit one time and walking together back from Rongpayaban Klang past the central Bangkok prison museum. He’d been there many times, but wanted to share with me, so we stopped and wandered through. This museum is attached to the park that we have dubbed the “nearby slide park” because it has the nicest playground equipment in our corner of the city. Outgoing and unashamed Wa would often greet new people by saying hello and shaking their hand – always watching to see how people would respond to his missing fingers.